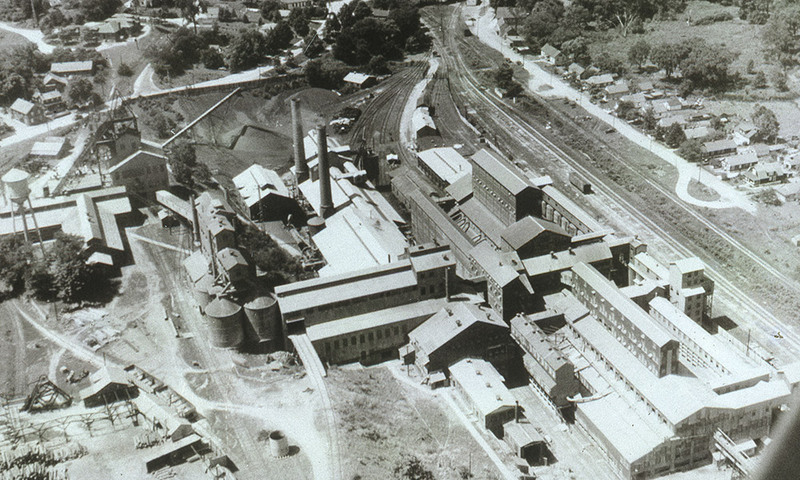 An aerial view of Mill no. 2 (Palmer Mill) in Franklin. Franklin, New Jersey, and its close neighbor, Ogdensburg, are the homes of the world’s most famous zinc mines. The zinc ore here was fabulously rich, averaging nearly 25% zinc by weight, and there was a lot of it; over the years these two mines produced 33 million tons of ore. By any measure these two orebodies and the metamorphosed limestone that encloses them comprise one of the top ten mineral localities in the world, a fact known to mineral collectors and professional mineralogists alike. The Franklin orebody in particular is famous for its spectacular fluorescent minerals and abundance of rare mineral species. Indeed, nothing closely resembling it has been found anywhere else on our planet, save its sister orebody at Sterling Hill, 2.5 miles away in Ogdensburg. By the early 1950s the Franklin mine was nearing the end of its life, and in 1954 the last of the ore was raised to the surface. Many in the community at that time wished to preserve the heritage of this great locality. Miners sold specimens to collectors out of their basements, scientific papers on the deposits continued to be published, and, in 1959, a group of collectors banded together to form the Franklin-Ogdensburg Mineralogical Society (FOMS), still in existence today. One of the stated goals of FOMS from the start was to assist in the founding and support of a museum in Franklin dedicated to the local minerals. Enter the Franklin Kiwanis club, which took on the challenge of creating just such a museum as a community project. Five years later, thanks to the efforts of the Kiwanians, some of whom were also FOMS members, the Franklin Mineral Museum opened its doors to the public.